I love these old, old wood benches that speak of time and moments spent with the family talking about anything under the sun. My brother had this made a long time ago and it’s now a permanent fixture in our garden in the province. This is where we take morning coffee while watching the sun slowly show its face in the horizon and the only sounds you can hear are our voices, our dogs barking and the chickens begging for morning food. 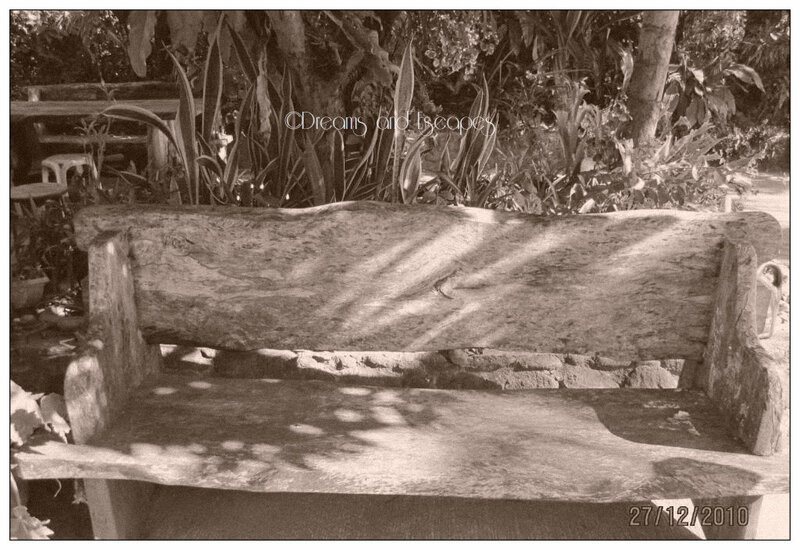 This bench also reminds me of another old one in Caleruega, another favorite place to savour the silence. Thank you Let! Nakikita mo yung asa likod? La mesa at upuan din yun kagaya nito. I forgot the name of the wood. Nung dumaan yung bagyong Frank eh natumba yung ibang kahoy dun so my brother have them made into garden furnitures. Yung Isa yata made of Sampaloc.